These decorations have been known since the 14th century, but special popularity was gained in the Victorian era. From the hair of their loved ones people made bracelets, chains and earrings, put them in brooches, rings and pendants, and it was all very fashionable mass believes and still exists in large quantities. Such ornaments are very much at the antique auction sites. What is striking is how skillfully and subtly made these things. 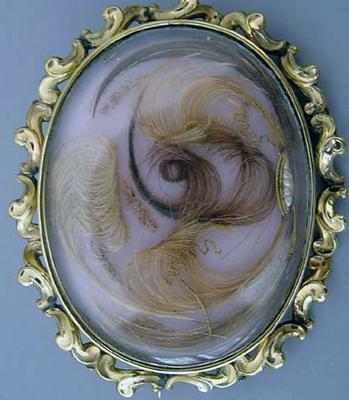 From the hair massively wove garlands and put them in a frame under glass, as family photos. In memory of the dead members of the family and have these things in a place of honor in the living room, near sometimes placed the frame of the family tree of the family. For us, these works seem odd manner of exhibitionism hair, even beautifully woven, somehow does not fit in with the current concepts about jewelry.